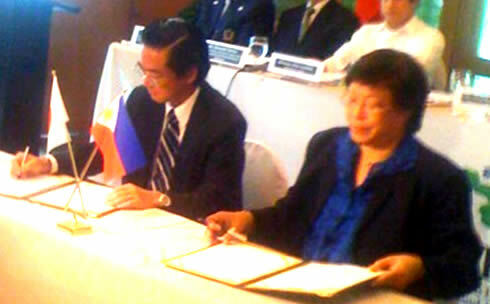 Dr. Grace J. Rebollos (seated right, foreground) and Japanese Ambassador to the Philippines, H.E. Makoto Katsura (left) ink MOA for aJapanese grant to build a new floating school. A new floating school for Bajaus will soon ply the waters of Zamboanga City. Bajau children aged seven to fifteen will once more experience the joy of learning their basic reading writing and Arithmetic. A mobile teacher from the Alternative Learning System (ALS) of the Department of Education (DepEd), this city, who knows how to speak the Bajaus’ native tongue, will be assigned to teach. This was learned from Dean Lucio Somblingo of the Department of Extension Services and Community Development, Western Mindanao State University, who coordinates the project implementation together with Dr. Rufina A. Cruz, Dean, College of Social Sciences. The project will be implemented under the Office of the President. According to Somblingo, after finishing the first ten months of the literacy course, the pupils will take the assessment and equivalency test to be conducted by DepEd. Those who pass the examination will proceed to the next ten-month phase of the program, after which they will take the acceleration test of Dep-Ed to determine what grade or year level they are qualified to enroll in. By this time, they are already prepared to enter formal school. Some 25 pupils each from the barangays of Taluksangay, Sangali and Maasin will be benefitted by the project. This lease on education is made possible through a grant from the Japanese government, through its Grant Assistance for Grassroots Human Security Projects, to finance the building of a new floating school, Somblingo informed. Unlike the old boat which was made of a wooden double hull, the new boat will only have one hull made of iron. The Japanese government is offering this grant in spite of its own dire need to rehabilitate its country and people after the killer earthquake and tsunami recently hit Japan. The Japanese government and the Western Mindanao State University (WMSU) signed a Memorandum of Agreement on March 25 at the Astoria Plaza Hotel in Manila to seal the deal. Japan was represented by the Japanese Ambassador to the Philippines, His Excellency Makoto Katsura, while WMSU was represented by its President, Dr. Grace J. Rebollos.